Globecast launch media broadcast centre in Los Angeles. 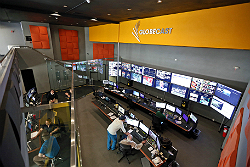 Los Angeles, March 2015: Globecast has announced the launch of its new Los Angeles Media Centre, offering broadcasters and content providers a converged workflow to prepare, deliver and playout content to any kind of distribution platform. The new Media Centre compliments established Globecast facilities in London and Singapore, enabling Globecast to offer a truly one-stop-shop for Media Management, Playout, Satellite and OTT distribution globally. 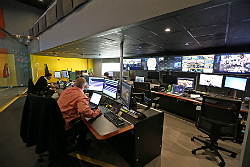 The new facility, which has been upgraded to include Globecast’s Media Factory for content logistics and converged workflow, brings broadcast and OTT solutions together under one roof, and leverages Globecast’s proven expertise in handling both linear broadcast and on-demand services. Globecast’s Media Factory steps beyond traditional media management, logistics and playout services. It replaces multiple, siloed operations, with a single, efficient process that handles everything from VoD preparation and content formatting through to creative services, quality control and compliance. The Media Factory approach allows Globecast to pass on economies of scale to customers who also benefit from the greater flexibility and the ability to scale up and down as required. A flexible and scalable workflow enables broadcasters to easily adapt to growing audiences or new delivery platforms without having to make costly infrastructure investments of their own. Globecast has already signed up customers for its newest Media Factory, including equestrian lifestyle channel, Ride TV. Internationally, BBC Worldwide is also a customer. The LA Media Centre features state-of-the art technology from leading providers to create a fully integrated and efficient broadcast facility with industry-leading redundancy and proactive and predictive fault monitoring.